So all this just happened….in 5 minutes. I got a call from a restaurant around 6:30. I had asked them to call me so I had to take it. I had fed the kids chicken (thank you Pinterest) and mashed potatoes (thank you Target) and berries. I had just explained how the salt and pepper grinders work to L when the phone rang. I answer the phone in my ‘phone voice’.. all moms have one. Or you will. ‘Oh hi Joe…if you hear terodactyl like screeching, ignore it. I do…” Just as I say this, M decided to stick his fork in his milk glass. The glass with no sipppy lid. The glass I will soon regret giving him. I continue to listen to my GM explain a situation. I confess, I was half listening due to the fact that L had just grabbed the gallon sized butter container, taken the knife that was in it and started licking it. Gag…oh and it’s dangerous. I hit the mute button. “Luca, sick. Knock it off..Don’t stick…too late. Just carve out that section”. Unmute. “uh-uh…yep. Totally illegal. How many write ups?” M decided to pour his milk onto his plate to make chicken potato soup. Sweet. L chose that moment to grab the salt shaker and figure out how to use it. Ever want 1 tbls of salt on 3 oz of mashed potatoes? Yeah, L either. The face was priceless. Mute button. Insert life lesson and ‘i told you so’ lecture. Still (and thankfully) oblivious to the chaos in my kitchen, the GM rambles on. I offer sage advice and then hit mute. Crap. M has stripped his pants off while standing in his booster seat. And pees. L runs over and grabs a towel. My dish towel. To wipe up the pee. Gag. Made a mental note to burn that towel. L hands the salt shaker to M and M licks the inside. Made a mental note to burn salt shaker. Then I notice Wrigley is eating. Under Teo’s seat…off an orange plate. He also is sporting a new blackberry stained tattoo. Wrig loves Pinterest chicken too, apparently. I tell the GM I will look into the rest of the issue in the morning. I’m not entirely sure I know what I’m looking into. As I dodge a Chugginton the train car. Teo. That kid of mine has an arm. It’s a grounded arm, but an arm nonetheless. I hang up. Length of the call….5:35. I’m tired. My kids are spoiled. On many levels–like they get fed; they get to watch Mickey on Demand and they get to sleep in until they wake up. Which I enjoyed until I was a single parent this week. Trying to wake L up so we could get out of the house by 8am was like trying to peel a fruit rollup. Close to impossible…and frustrating (you just can’t ever get the roll up off without a corner tearing)…but back to L. He reminded me of Weekend at Bernie’s…Lifeless, rag doll in Mickey jammies with some wild hair. I appreciate my husband so much more for dealing with that. Note to self: begging your kids to put on their own underwear just sounds weird when you play it back in your head…or in a robot voice (that was a parenting fail). M was equally as uncooperative. He asked for a ‘nonut’ the minute he woke up and was determined to get my attention. Standing in the wet shower, AFTER I had dressed him, and screaming ‘nonut’ did just that. Mission Accomplished. I believe we woke up the entire block. How many days do we have left??? If the locusts are coming, don’t tell me…. See that kid? He just cracked his noggin open. My little Rocky. Bookshelf-1, L-0. The best part of this story? J got to watch it unfold from Skype. I bet he loved seeing his kid’s head puff out like a mushroom from thousands of miles away and could do nothing about it. In fact, I tried to hang up on him so I could deal with this myself. Poor guy. Anyway, back to the bleeding kid…. He’s ok. Liquid stitches and Mederma for 3 weeks. 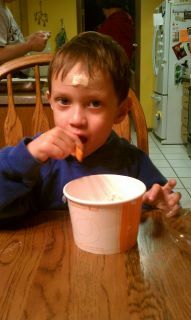 Chicks dig scars…or else we will grow his bangs out. All the cool kids are doing it. You know how when you buy a new car, suddenly you start to see the same make of car EVERYWHERE.?! Well, post-bookshelf attack, my kid (scratch that, J’s kid) decided to become Evil Knievel and fling his super skinny frame from all horizontal objects at Nana’s house. Grrrr. Yes, let’s go for 3 trips to the dr this week. (that was sarcasm, folks–I’m dripping with it. It could be blamed on the 6 total hours of sleep I have had since J has been gone). Speaking of sleep, I am praying my kids stay asleep for at least 5 hours tonight. Praying….I would be on my knees but I’m trying to get this blog done and now I have developed a twitch in my left eye that I’m pretty sure makes me more attractive than ever. This twitch could be blamed on lack of shut eye (the irony is not lost on me). I’m sounding like a terrible mother but I would rather go thru labor again than sleep with my kids. Wow, that really DOES sound awful. In theory, I LOVE and APPRECIATE my kids wanting to sleep with me. I’m lucky to have kids to sleep with me. But after 4 days of sleepless, rave-style, snot covered nights with flailing limbs and the disappearance of 800 pillows we have in this house of which none are on my bed now), I’m calling it my limit. I cry ‘Uncle’. And yet, the little zombies come. I visualized myself flipping out of the bony kid sandwich I was in last night. I had talked myself into it. I was pysched. Then I realized, I’m not that bendy nor are my legs able to find the edge of the bed without creaking or flailing themselves. I woke the zombies…who followed me to my room. Curses! Here’s to a non twitchy, non new stitchy or else I will be oh-so-#itchy, night. Fingers crossed. The entire winter has been illness and drama free. It was a miracle if you think about it. My kids play with a lot of germy kids (they call them friends) and haven’t been really sick all winter. J is in another country….like the Philippines by way of Tokyo, for 10 days. So of course, while he’s gone staying in the Shangri-La (seriously, that’s the name of his hotel in Manila), I’m here dealing with puke, ear infections, and cranky, snotty kids who choose to yak in the car. Yeah me! VIa Skype, J has been apologetic but man, it’s tough to change sheets or car seat covers by yourself. Also the 749 times a day the kids look/ask for him is awesome. They do love that man. Either way, the germy kiddos have been good. L has been telling everyone his dad is in Asia, visiting his kids. Just like in Ecuador, J is on site visits….but to a stranger, he sounds like a player visiting his illegitimate children. I’m pretty sure that isn’t the case, but he needs to bring us gifts, just in case. Can you pick up what I just dropped? That giant hint over there…. Later gators. The trail of yak awaits. Karma is at Chuck’s Bait and Tackle…. I can never do anything simple. Although I try, it just never pans out that way. If I imagine an outfit in my head to wear, I realize it’s still in the dirty clothes and needs to be washed. So…I wash it. No worries, thanks to the G-A-P, I still own the majority of the ’98 black watch plaid and the ’00 rose sequined jeans lines. So it’s not like I don’t own another shirt. Just can’t make things easy. Oh, and I’m also late. A lot. You feel pretty bad for J now, don’t you. Yeah, me too. The drama today started yesterday. One of my co-worker’s parents passed away. I was ‘nominated’ to attend the funeral on behalf of our team. I sent flowers to the funeral home yesterday. (yeah for being early for something). The address I sent the flowers to was in Warrensburg, MO. I didn’t google the address for the services because I travel there for work so I was familiar with the town…but not the churches. This would be the beginning of the crazy. The services started at 230. I left my office at 145. For those of you aware of the geography…that wasn’t enough time. But if you go 85, you are only 10 minutes late. Not that I would know. God bless my friend Heidi. I call her on the way down there and beg her to google map this place for me. I couldn’t find the address on my phone…not that I was trying. Ahem. Anyhoo…I pull into what I think is the place, only 10 minutes late. Now, I had changed coats and applied 2 layers of chapstick while driving so I could ‘tuck and roll’ out of the car and slide right in like Kramer on Seinfeld. I did have a moment of panic…what if there wasn’t a vestibule for me to scope out the place(for those unfamiliar, that’s the place you let your kids run around in during church. ;) ), what if there was just a door into the church (like JFK, Jr and Caroline’s)….that would be awkward. I bust my daydream by realizing there isn’t a car, person or hearse in the parking lot. I might have cursed a bit. I call Heidi back and tell her ‘we’ were wrong. I swerve into the funeral home to ask for directions and stand there awkwardly for a few minutes. Of course, there are 2 services going on at the same time. Of course there are. I have awesome timing. A lady proceeds to tell me ‘Oh my, you are late’ Uh, duh. I ask for directions and she responds by verbally telling as well as turning in a circle as she acts out the directions. So helpful. She told me to head to Knob Noster by taking Hwy D to Hwy YY and then asked me if I knew where Chuck’s Bait and Tackle was. Um, no. I felt like I was Danny Davito in My Cousin Vinny. I jump in the car and call Heidi again. I told her I felt awful because I was representing the team and I was not going to make it. I told her I was just going to head to Knob Noster and look for it. Pretty sure she was judging me when she said ‘you are just going to drive there?? ?’ Sure, what the hell. I’m already out here… I don’t want to get bad karma. As I am talking to her and my friend Jill, I tell them both ‘how big could Knob Noster really be?’. Um, turns out..quite big. I ran up on a cemetary and it turns out the be the one for the burial. Previous conversations with my co-workers included me just going to the service and not the burial. And yet… I have missed the service (as much as I wanted to meet Chuck and see his tackle) and am smack dab across from the burial. Ain’t that a kick in the pants. After waiting 45 minutes in a field like a creeper, I see the procession. I pull in behind the last giant 2 ton truck with ‘Eat Meat’ mud flaps. Side note: it is not awesome to be the last car in the procession and have squeaky brakes in a cemetary. Not awesome at all. I pull in and instantly make a new friend. As everyone has bowed their heads, this man with a sweet mullet and a Dodge Spirit with a license plate that said Ike, leans over and whispers (in the loudest church whisper) ‘Are you related ?’ Really, Ike? Look at me. I’m dressed in all black, I’m the only diverse person here and I’m the only one NOT wearing wranglers and carhart jackets. I say my hello’s and feel good about making it to see the family. I text the girls and tell them my karma is gonna be ok. I take a little walk around the car to make sure I’m not going to hit anyone ‘living or deceased’. I start to make a 34 point turn to get out of there and am pretty sure I ‘bumped’ somebody. As in someone with a tombstone on top of them.